The DYNAMOS is just the band anyone needs, to get their full ear and eye dose of originality and rock and roll swagger. Banging, beautiful, and beyond brilliant, this group of Los Angles rockers know exactly how to blow the roof off of any venue, mesmerize a crowd with one look, and stop time with a single chord. All that said, this five piece band is something else, creating smashing music and performing like nothing else matters. They are the total package, in every sense. 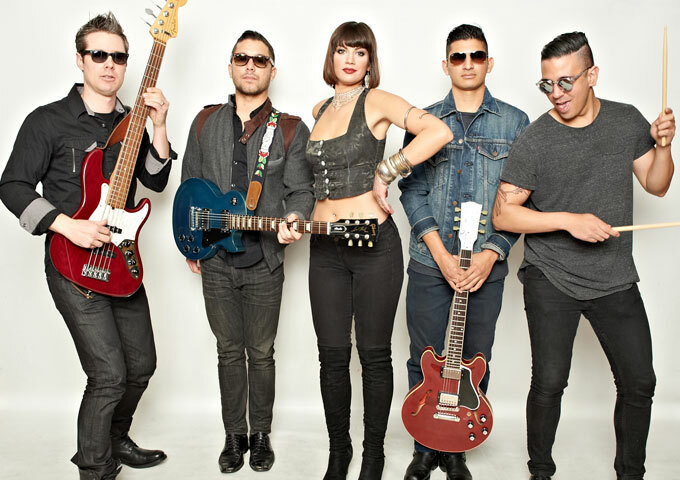 Comprised of Nick Schaadt (music director, bass), Jacob Mayeda (guitars), Ian Nakazawa (drums percussion), Carlos Barrera (guitars), and lead singer Nadia E.
Of course I would be lying if I didn’t say that Nadia E was the first thing I noticed about the DYNAMOS. And that’s because I happened to watch the video before I listened to the single of “Knowledge”. Something I always avoid doing, so as not to be influenced by image. Yes I know, I’m old school, I still believe that music is strictly a radio medium, and that video is a nice afterthought. Having said that, I do understand the marketing power and the creative possibilities of visuals to enhance the musical experience. One look at Nadia E, though, and you’ll thank your lucky star for music videos. I know, I did. She is something to behold beautiful and alluring, she dominates the stage setting, before she even opens her mouth to sing. She is the kind of front-lady most bands would dream to have in their lineup. Nadia E is the capital K in killer, when it comes to knocking out an audience. I instantly realized that she would totally diminish my impartiality towards the music and the rest of the band. So I switched of the video and flipped on the audio track. And guess what? Opera-trained singer Nadie E is a knockout vocalist, too! And in my honest, now unbiased opinion, the latest single, “Knowledge”, by the DYNAMOS, is a great piece of work. The pure rock n’ roll groove on this track, took me back to a time when the music was the driving force for artists, creating something they loved and not conforming to the mainstream and the expectations of the charts. Though that may truly be a natural consequence here. The band is tight, with great chord progressions and superb guitar work. The rhythm section of drums and bass, also supply this song with all the under-the-hood oomph necessary. From everything to anything, the DYNAMOS know just how to enthrall fans with their well written music and dynamic performances. The thing I like most about the band though, is that they seem to be so natural about what they’re doing. Notwithstanding their stunning all-round musical and visual package, there is nothing pretentious about how the DYNAMOS present themselves to the public. They’re so upfront and real, it’s almost tangible within their music. “Knowledge” will get you up on your feet and keep you in the groove, because the DYNAMOS simply rock. Now excuse me for a second, while I go back and watch that video…damn!